For participating in a protest over non-payment of their 13 months' bonuses and other entitlements, the Executive Director, Administration and Finance, Delta State Oil Producing Development Commission (DESOPADEC), Askia Ogieh, is said to have ordered the arrest of one Mrs. Doris Ogbor. SR reports that Ogbor, a mother of three, is currently being remanded at the Okere Maximum Prison, Warri, Delta State. In January 2017, aggrieved workers of DESOPADEC protested n*ked over "maltreatment and refusal to pay their 13-month' bonuses and other entitlements". One of Ogbor's colleagues, who asked not to be named while speaking with SaharaReporters, said: "The arrest and trial of our colleague resulted from the protest by workers of the DESOPADEC over the non-payment of our 13 months' bonuses and other entitlements". According to a staff member of the commission, "among all those who participated in the protest, Mrs. Ogbor was singled out by Ogieh and was arrested and charged to court in Warri over trumped-up charges. Doris is reported to have been remanded in the Okere Maximum Prison in Warri. Some senior management staff of the commission who confided in SaharaReporters stated that all efforts to pacify Ogieh were rebuffed, as the Executive Director was said to have claimed that Governor Ifeanyi Okowa was aware of the issue and was in support of the arrest and court case. "For the past one week also, we have tried all we could to pacify the Executive Director, Administration and Finance, (DESOPADEC), Askia Ogieh, to drop whatever trumped-up charges he has against Mrs. Doris Ogbor, who is also from the same ethnic group with him. But Askia told us pointblank that he was not afraid of anything, that Governor Okowa was fully aware of the arrest and the court case," a senior member of staff of the commission said. "He said to our faces that the he has the Governor's full backing on the issue and Doris will rot in jail. After the arrest of Mrs. Doris Ogbor, she was first charged to the customary court. After a time, Askia Ogieh withdrew the case and to the surprise of everyone, he took the case again to the High Court in Warri with trumped-up charges and she was finally remanded last week in Okere Maximum Prison, Warri." Speaking on the development, a director in the commission who preferred not to be named, expressed disappointment and sadness over the action of his colleague, Ogieh. "We have all condemned his action. Askia's name is synonymous with trouble. Since the inception of the board, he has continued to give the commission a bad image," the director said. "He is so arrogant, corrupt and fraudulent. 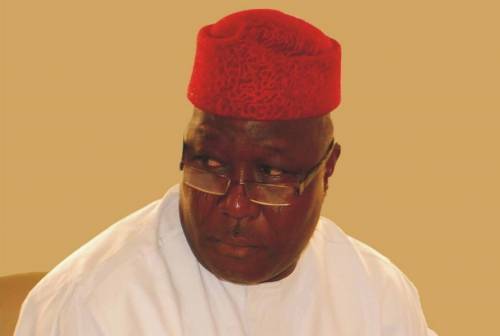 Askia used his closeness with the governor to intimidate management and staff. He inflates contracts, collects kickbacks from contractors, uses fictitious company names and cronies to grab contracts from the commission." Meanwhile, management and staff of DESOPADEC have called on the Governor to intervene in the matter so that Ogbor can get her freedom and reunite with her family. Contacted on the issue, the Chief Press Secretary (CPS) to the Governor, Mr. Charles Aniagwu, expressed shock over the linking of the Governor to the issue, saying: "Of course, you know the Governor cannot order the arrest of any innocent person." Aniagwu promised to find out what was happening. All efforts to reach Ogieh for comments proved abortive, as several calls and messages put to him were not responded to as of press time. SaharaReporters reliably learnt that come December 4, 2018, Ogbor will be brought to court for continuation of the case.